Being single when Valentine's Day is approaching is no fun. For some, that is, but I actually find it one of the most anticipated times of the year, because restaurants and F&B businesses will be racing to come up with something special and exciting to attract the lovebirds out there. For me, I enjoy trying the special menu preview the most, so it doesn't matter if I'll be eating popcorn and watch The Flash series alone at home on the evening of 14th February. LOL! One of my favourite restaurants in Jakarta is serving up a delightful feast for all the lovebirds celebrating this year's Valentine's Day. I've braved the harsh reminder of my relationship status and tried the line up of sumptuous V-Day menu created by the charming and brilliant Executive Chef of Akira Back Jakarta, Andri Dionysius. Repeating last year's success, Chef Akira Back will be spending the weekend of Valentine's day in Jakarta again (to work and oversee his team during the important event, of course). How exciting is that! This is arranged amidst Chef Back's super packed schedule for the opening of new Akira Back restaurants in Seoul, Bangkok and Dubai. I wish Chef Back all the best of luck for his projects. 1st course (to share): Tuna Pizza - micro shiso, ponzu mayo, white truffle oil. I started with the oxtail pot sticker, the semi translucent skin still crispy from the pan-searing and the oxtail was so tender. Then I tried the fresh Canadian lobster, already tasted sweet & juicy on its own, but the seaweed butter sauce elevated the whole thing into one beautiful dish. 4th course: Slow Roasted Wagyu Tritip - Eringi, tomato confit, burnt onion puree, truffle jus. Two incredibly tender and juicy tritip steak with slightly burnt and crispy edges. 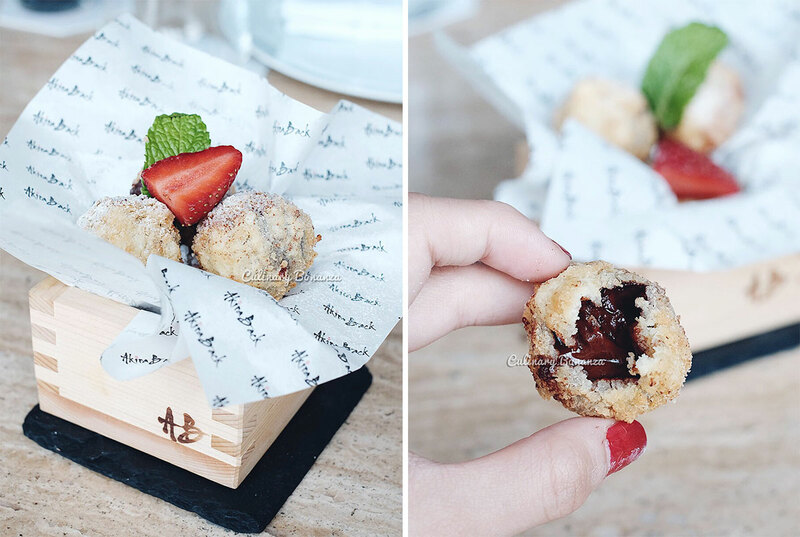 So divine it was that I'm sure even the most talkative date will shut their mouth to savour each and every bite. The burnt onion puree was quite unique and taste unexpectedly good too. 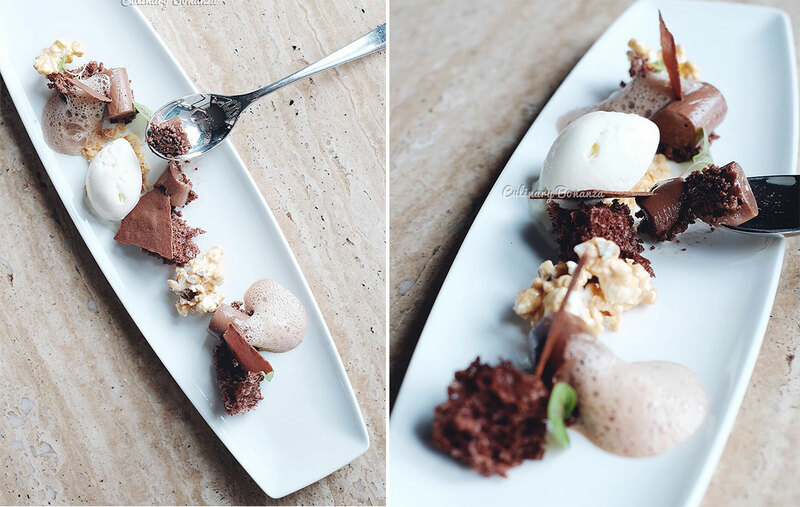 The whole plate is made with Valrhona's Grand Cru chocolates range, processed into various forms and textures of chocolate: Gianduja mousse, Ivoire ice cream, 30 seconds Araguani cake, Jivara lactee cloud, Dulcey & Maldon popcorn. Mignardise: Chocolate Croquette filled with Manjari 64% Grand Cru Valrhona chocolate.This is heaven for me, the taste of melted bittersweet, tangy with hint of berries Manjari chocolate was just unforgettable.